The weather radar and sky didn’t look too inviting this morning, so we decided to get an early start to Austin. It turned out this wasn’t necessary as the weather broke up and there was no rain at all. This was good, but it meant we missed out on some fine roads because we took a more direct route to Austin. Drat! We did find a couple of fabulous roads – no traffic with nice sweepers. There are plenty of excellent roads in the Texas Hill Country, which we missed. Guess we’ll need to come back another time. 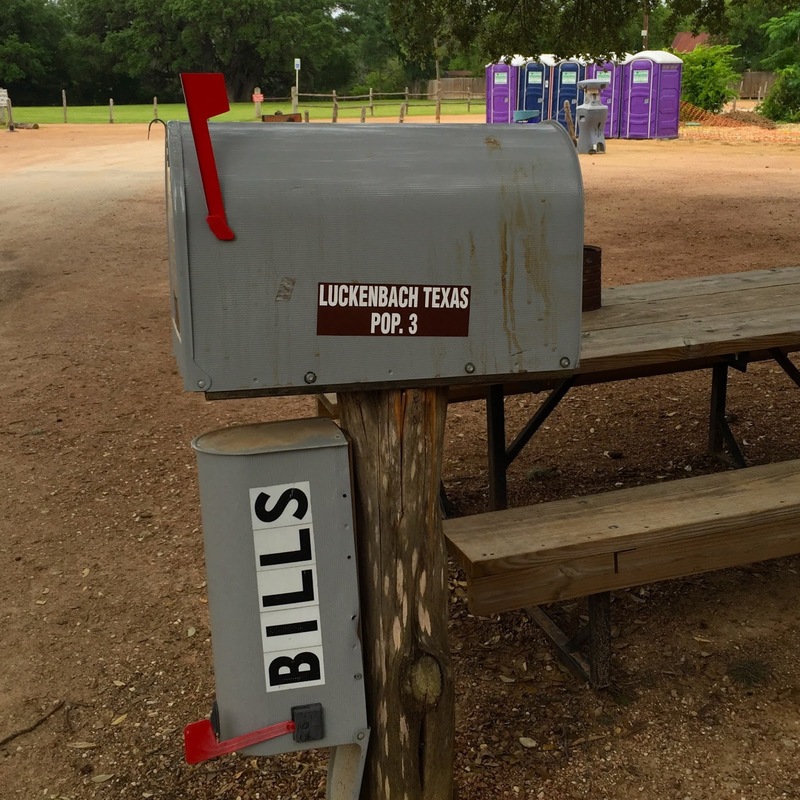 A short ways outside of Fredericksburg is the community of Luckenbach – famous for being the subject of the song "Luckenbach, Texas (Back to the Basics of Love)", sung by Waylon Jennings (written by Chips Moman and Bobby Emmons). Luckenbach’s oldest building is a combination General store and reputedly opened in 1849 (or maybe 1886). The community, first named Grape Creek, was later named after Carl Albert Luckenbach. Luckenbach's population increased to a high of 492 in 1904, but by the 1960s, it was almost a ghost town. A newspaper advertisement offering "town — pop. 3 — for sale" led Hondo Crouch, a rancher and Texas Folklorist, to buy Luckenbach for $30,000 in 1970, in partnership with Kathy Morgan and actor Guich Koock. Crouch used the town's rights as a municipality to govern the dance hall as he saw fit. Today Luckenbach maintains a ghost-town feel with its small population and strong western aesthetic. One of its two main buildings houses the remnants of a post office, a working saloon, and a general store. The other is the dance hall. The post office was closed on April 30, 1971 and its zip code (78647) was retired. The general store remains active as a souvenir shop where visitors can purchase a variety of items, including merchandise featuring the town's motto "Everybody's Somebody in Luckenbach", include postcards, T-shirts, sarcastic and humorous signs, and the local newspaper, the 8-page monthly Luckenbach Moon. Today Luckenbach is mainly known for Country Music, hosting live music almost daily. We were too early for the day’s free live music, which was a darn shame. Rosie Flores, who sings alternative country music and has a beautiful voice, was going to play later in the afternoon for free. But alas we could not stay. Post Office/General Store and Saloon. Please note the combo of ATM and Outhouse. We headed towards Austin on a couple of different two lane rural routes with 65 MPH speed limit. This was pretty easy to maintain! We arrived at Jerry and Kate’s early and regrouped. Jerry is my oldest son and Kate is his fiancé. They both hold positions at the University of Texas in Austin, but are new to Texas, via Manhattan. Between them and prior to Austin, it was Columbia, Yale, Stanford and UCLA - somewhat different environments. I was anxiously awaiting to hear about their new cultural experiences. They would be arriving from a conference in San Francisco later in the day, so we let ourselves in and proceeded to make a mess of their home. It was good for us to catch up with them again. The last visit was in San Francisco over this past Christmas / New Years – just before their move to Austin. So, next were dinner, Texas beer and Texas wine (we found some great Texas wine, which was a surprise for Judith and I) and a bunch of catching up. Good nights at about 1:30 - ugh!